I just saw a cute end to a top-level chess game that ended in a forced draw because the would-be losing side managed a swindle by giving away all his pieces by force in order to create a stalemate. If you don’t play chess, a stalemate is what happens when it’s your turn to move and you have no legal moves. You can claim a draw when you are totally trapped in this way. 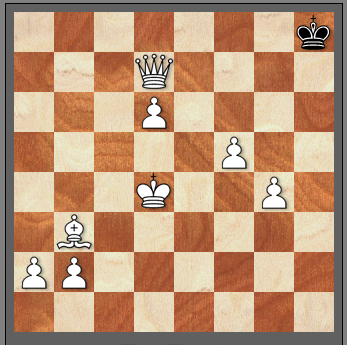 So one way of saving an otherwise losing game, when you are outnumbered and about to be checkmated (losing when your King comes under attack and it’s your move and you cannot stop the check), is to find a brilliant way to be unable to move. Black forced a draw through being stalemated! Is this a totally bizarre concept or what? Why was this rule of chess invented anyway? Wouldn’t it make more sense if being trapped meant losing, like it does in real life conflicts? Stalemate was apparently standardized to be a draw in the 19th century. Before that, conventions differed on what the outcome of the game was supposed to be. Now and then, notable chess players have called for the abolishment of his rule, to replace the stalemate with a win for the side that trapped the other side, because this is “logical” and corresponds to what you would expect in war or in some other “real life” situation in which you have pressed hard for a long time, accumulated a lot of force, and can cause your opponent to not be able to move at all. I’m going to be blunt: I like that stalemate is “illogical”! It creates tremendous difficulty for the side with more material to win in endgames. I like that it gives the underdog a chance to avoid losing by being clever. If stalemate were not a draw, then it would be trivial to win many games in which one side has made a mistake and lost a Pawn, because then all that has to be done is trade everything off until all that remains is a King and Pawn versus King, and declare victory. Stalemate means that the side with the extra Pawn has to work super hard to avoid trading everything off, to avoid just mechanically fighting battles with equal losses on both sides until one Pawn is left. I like stalemate because in real life, often it is too easy for one side to win just because of an early error by the loser. Chess is not real life, and I like it that way. Stalemate and other rules of chess add bizarre whimsy and creativity to the game, just as the rule of checkmate at all is counter to real life. In real life, you can kill the general of an army and still lose the war. In chess, it’s always like in the movies, on the other hand: you can have a lone hero defy all odds to get at the enemy King and sacrifice everything else for this objective, and have a happy ending. There is something romantic about chess that is part of its appeal to me. Chess is a game of logic but according to weird heroic rules, where sheer material wealth is not enough to guarantee a win. It is unfortunate that many top-level chess games end in a draw, but to abolish stalemate would change the capricious character of the game in a way that ruins its appeal to me (on a lower level of play). If you are not a chess player, what do you think of the stalemate rule? If you are a chess player, what do you think of it?